I’m supposed to be working on our master bedroom makeover. But when an idea sparks your brain in your sleep, you know you just have to go with it – ASAP. 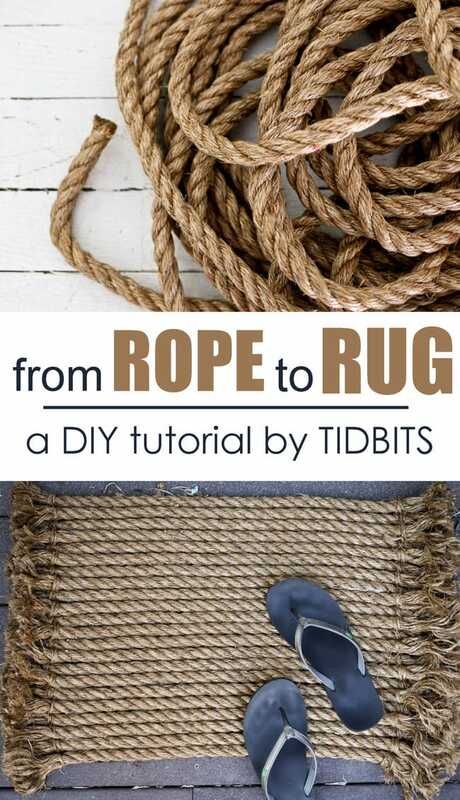 So – I would like to show you how to take boring rope, and magically turn it into the most charming rug (or floor mat) you have ever seen. (Zero sewing, by-the-way). At first, I was a little skeptical of my “brilliant midnight revelation”. Those kinds of ideas don’t always work out, ya know. 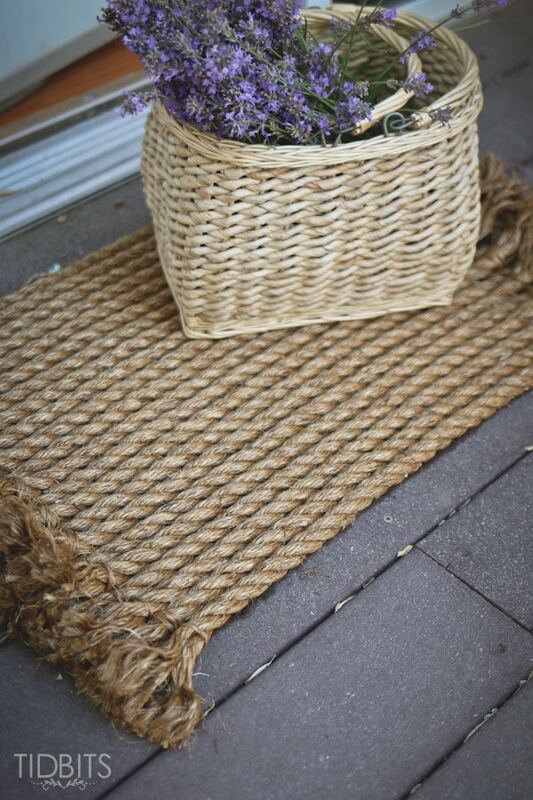 I’d seen rugs made from rope in a circular fashion, but never DIY’ed like I had dreamed. I was simply going on the faith of a half awake thought. 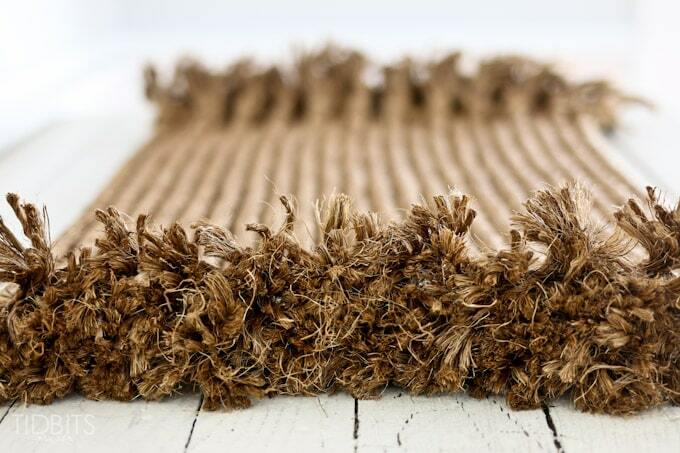 I was hoping in the end, it would rival an expensive jute rug – mini sized. 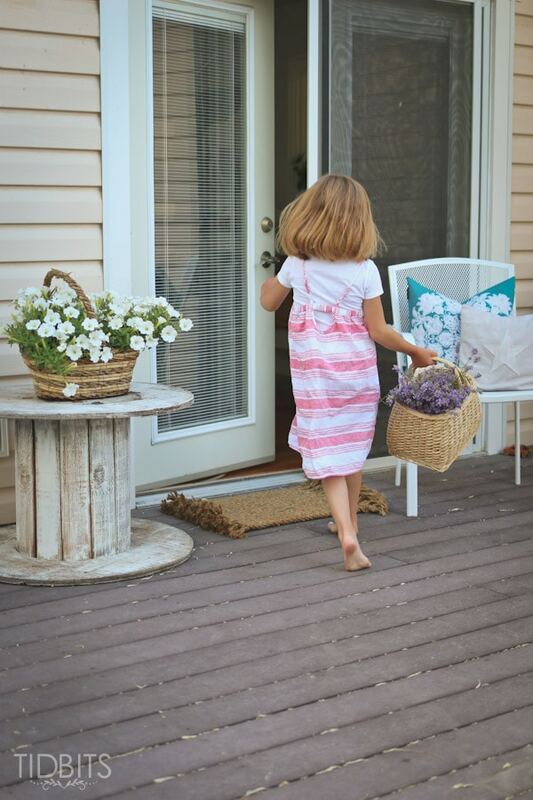 I imagined it would make the perfect rugged outdoor floor mat, and would grab all the dirt from little ones toes before they entered my house. I knew I would love the color, lines and texture of rope lined up nicely in a row. 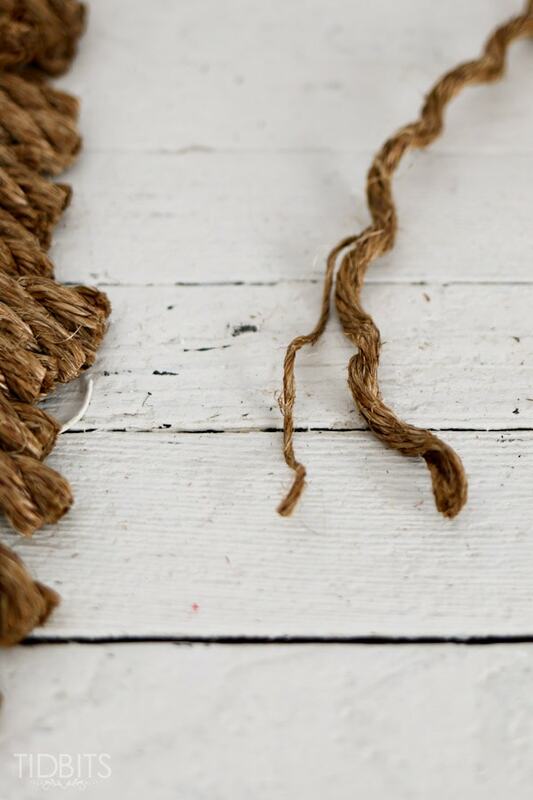 After a little trial and error, I managed to duplicate the rope rug from my dreams. 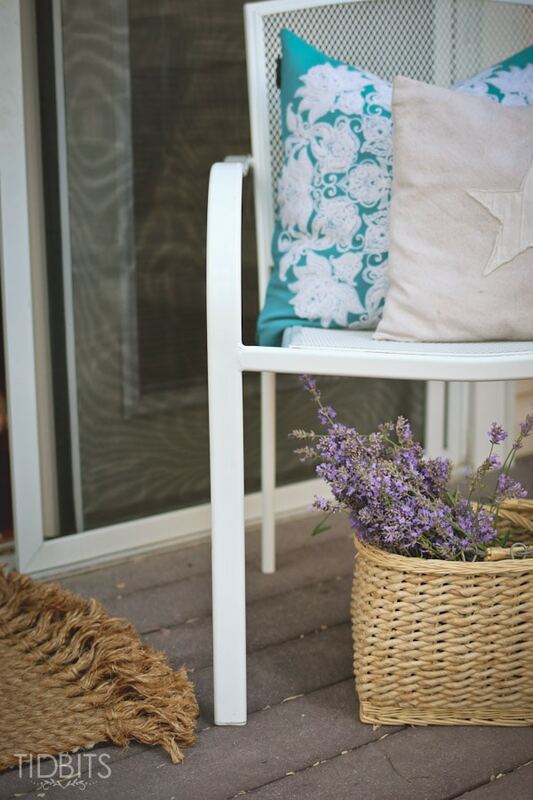 We love this new addition to our home so much . . .
. . . I almost can’t wait to fall asleep again in hopes of another vision of loveliness. In the meantime, I wish to assure you that dreams do come true. And that is a wonderful thought. 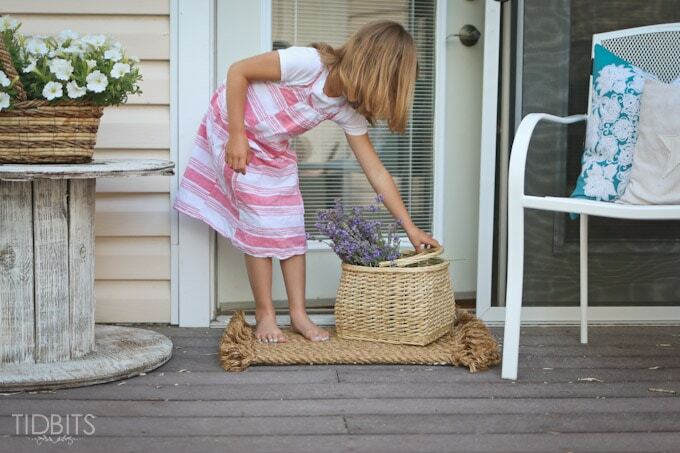 If you love this little floor mat as much as I do, I wanted to be sure to show you how to make your own. 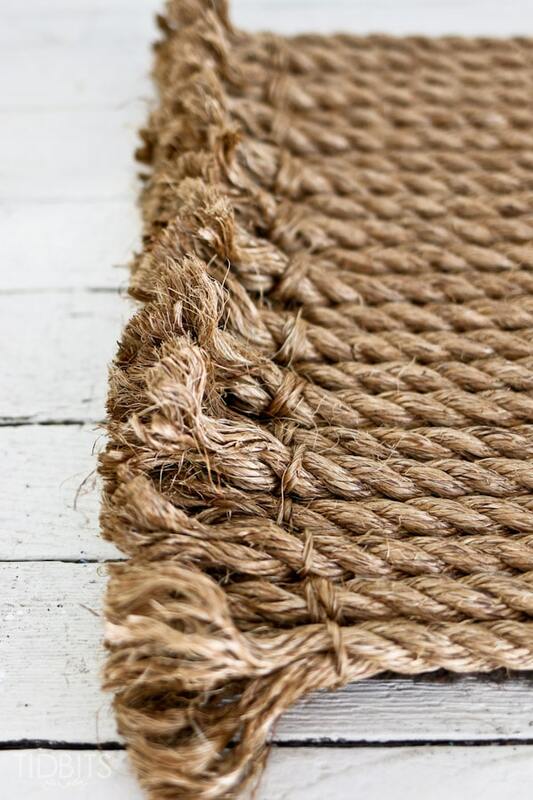 So let’s first talk about the supplies you will need and then I’ll show you step-by-step how to recreate your own rope rug with fringed edges. Right. That’s kind of obvious. The type and variety is so flexible. 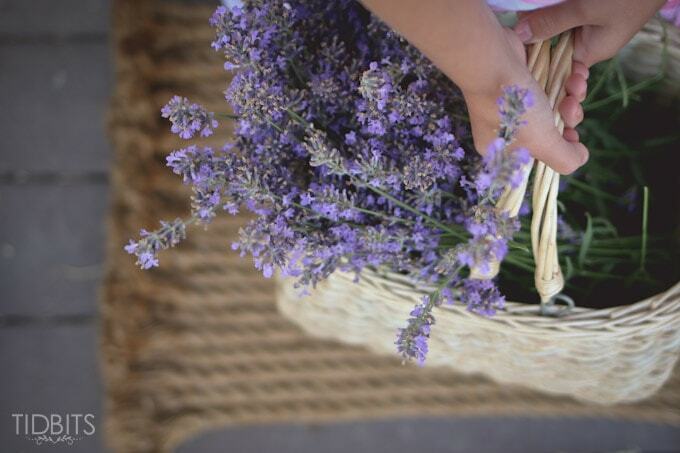 You can choose from natural fibers or synthetic, all depending on the look you desire. You can also select a variety of thicknesses. I opted for a natural fiber rope which was 5/8 inch in diameter. (HERE is the exact rope I bought, but from Amazon). How much do you need? This is a super tough question to answer. It really depends on the size of rug you want to make and how much you want to spend. You may need to sit down and do a little math. I did this to kind of ballpark how much I would need. I determined how long of strips I would want and then used a measuring tape to mark 5/8 inch markings down to the size I decided. I ended up buying 60 feet of rope, which ended up being slightly too much. My rope cost .58 cents per foot so the rope cost around 30 dollars. Not bad for a rug you could see at Pottery Barn, am I right? 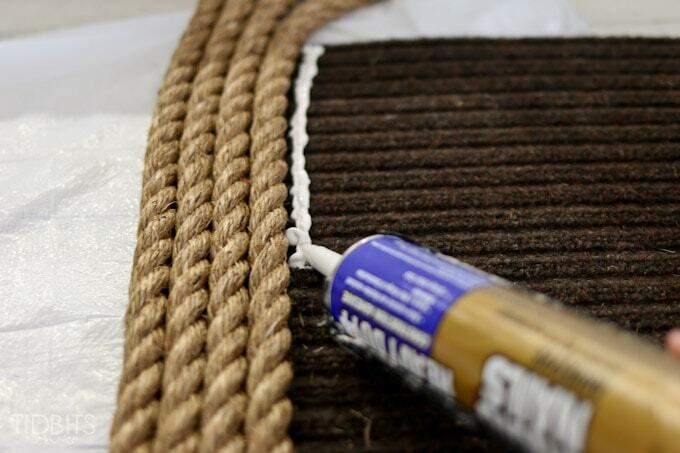 This is to glue your rope onto, to give it the structure it will need. I found a 3 dollar door mat from wal-mart which worked great. This mat I found was way larger than I planned to make, because I would have needed twice as much rope to fill the surface (and I had already spent more than I wanted to for a rug). I wasn’t concerned about that because I picked a mat I could easily cut to the size I planned. If it says indoor/outdoor use that is all the better. 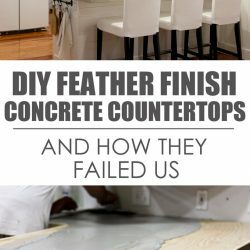 My husband and I debated on the best type of glue for this project, and after it is all said and done – I feel like this glue was perfect for the job. The rope is very secure. 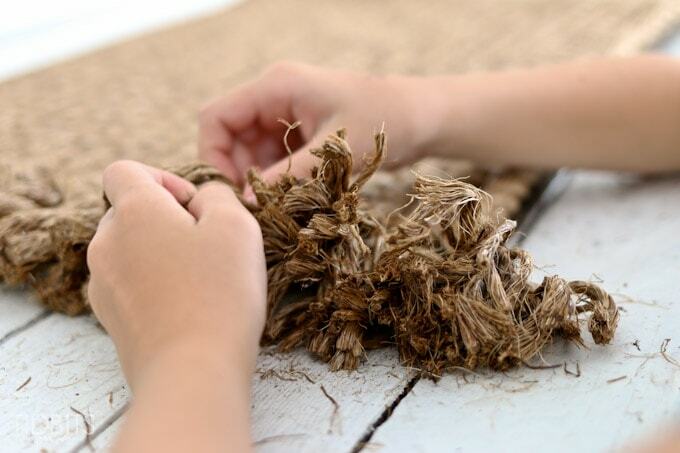 The first thing you’ll want to do is cut all your rope pieces to size. I measured them up to the length of the mat, and then added a few inches extra to each end, for the fraying effect. To cut the rope quickly, we used a sharp razor blade cutter thing from my husbands pile of tools. Then I just began spreading glue in rows and laying my rope directly on top of the glue and pushed as closely together as possible. Some things I did learn, was that this process took longer than hoped. 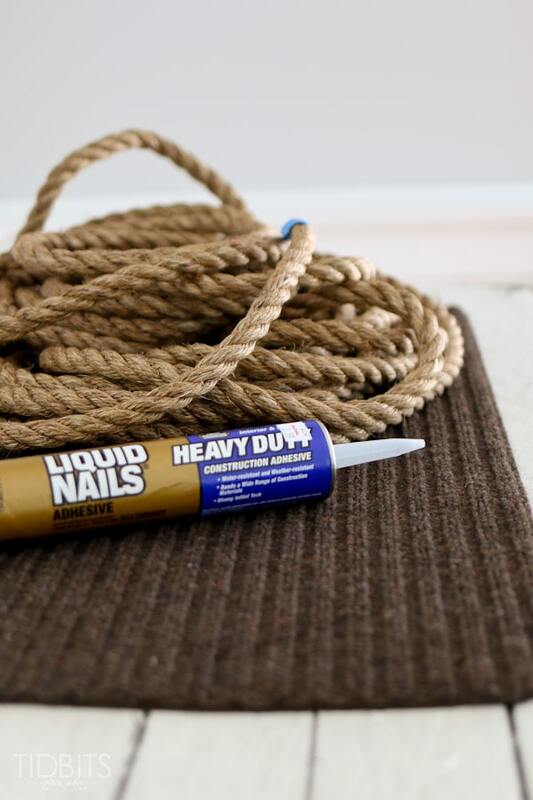 Because the liquid nails does not dry quickly, your rope may shift from where you place it down. I found it best to lay a few rows down, place heavy books on top of those rows for a couple of hours or so – and then the glue was dry enough on those previous rows to be added to. But once that glue was completely dry, the rope feels like it will never move. 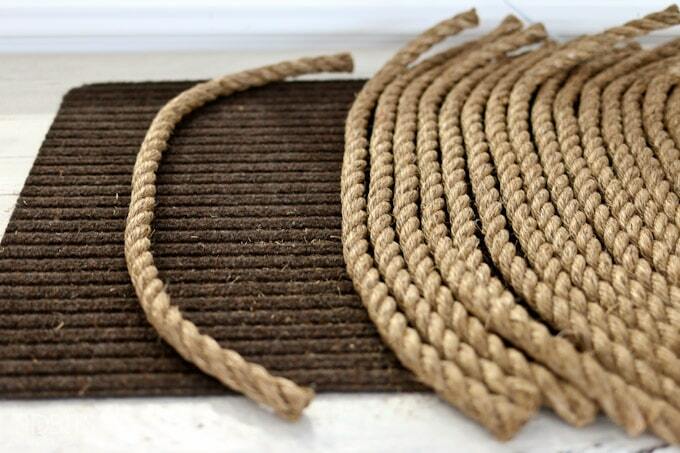 After my door mat was completely covered with the rope, I took some extra rope and unwound the coils so I had some smaller threads to work with on the ends. I simply wove the threads through and around each open rope on the ends. Then I put my 8 year old daughter to work to help me unwind and fray each end piece. This did get a little messy. But the results looked fantastic. And that was really all there was to it. A very quick and rewarding project. Feel free to pin an image to your boards so you don’t forget where to find this tutorial! I would love to hear if you like the look or not, and if you give it a try! **This article contains affiliate links – but you can rest assured I only recommend products I use and love. Excellent! 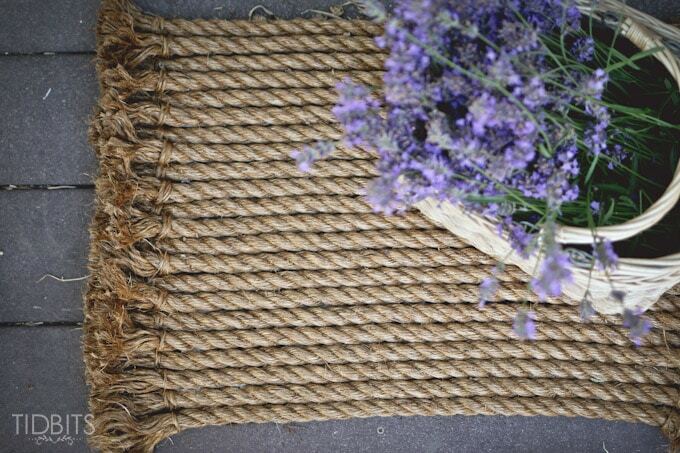 I have an old mat made from lobster trap ropes and I love it. Although, I don’t love the bright colors as much as I love the muted look your mat has. That sounds really lovely though! Rope adds such a wonderful texture to everything. Thanks for always supporting me Liv! Oh yes, I do like it…a lot. I’m going to pin it so I can make one in the (hopefully near) future. It’s way cool! And your daughter is a great blog model. She’s adorable! So clever! 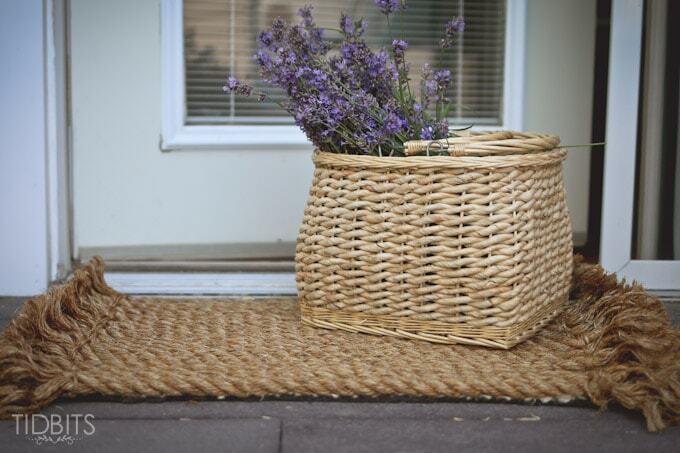 I am thinking my back door needs one for my dog to wipe her feet on! Oh my gosh….you are brilliant! 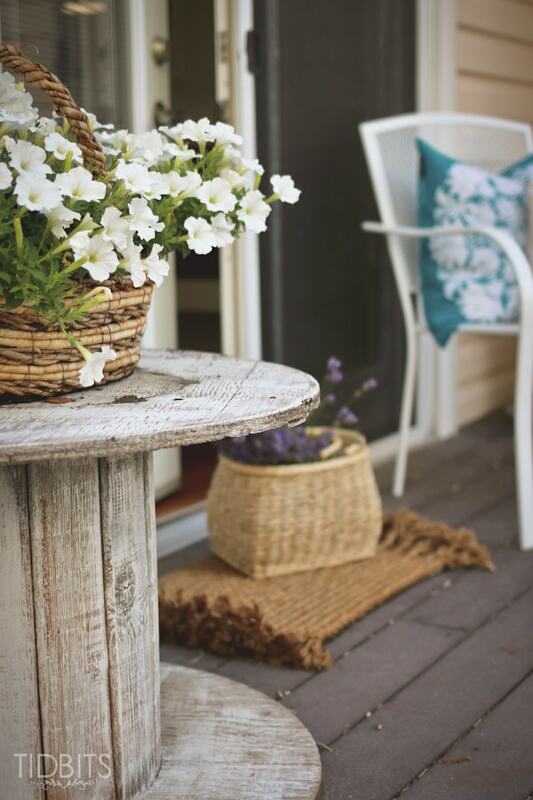 Absolutely LOVE the look of this rug and your photos are so charming! 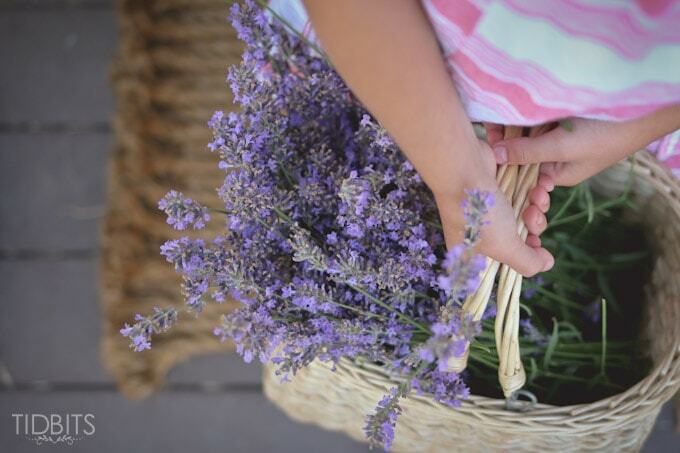 Sow your post on craftberrybush ….and looks too cute. Going to pin for a later time as school projects come first.. This is a beautiful rug! 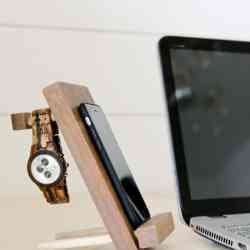 I will most definitely be making a similar one in the near future. Thanks for sharing! Visiting you via the Creative Spark link-up. Love it! I love anything natural looking and this is so perfect. Gotta get me some rope! Keep a pen and pad handy by your bed…don’t want to miss any fantastic ideas! LOL Found you at The Shady Nest. What a sweet comment! Thank you! 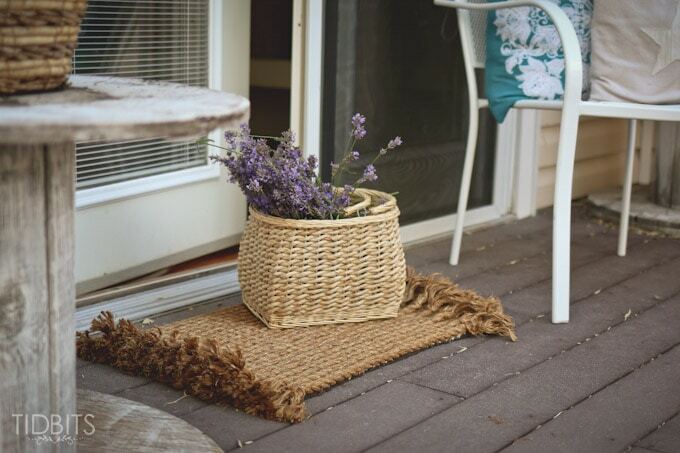 This rug has been holding up great and I too love the natural look of it. Thanks for coming by! Oh my!! 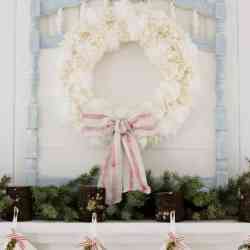 I just found your blog via your feature on Craftberry Bush, and I absolutely love the.whole.thing.! Your styles is impeccable!! Thanks for the inspiration! 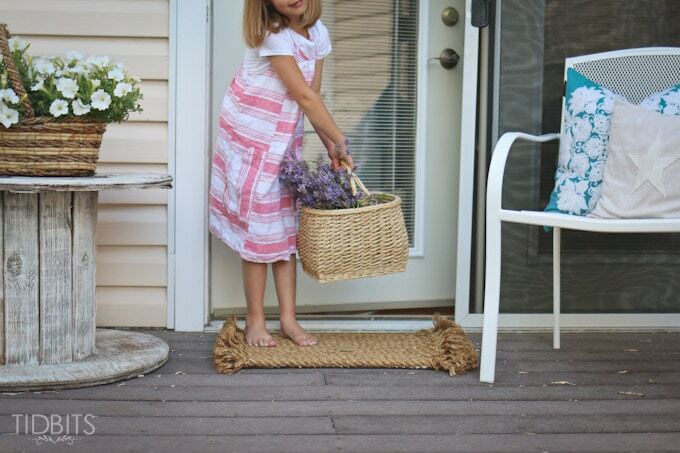 Awesome Rope Rug, Cami! And it’s such a great DIY ~ really easy to follow! I’m due a change just about now, so many thanks for posting this! I may want to try Holiday versions later, somehow “weaving” in Fall & Christmas imagery! Perhaps you could have a dream or two, as well, about those!!! I absolutely love this doormat. I can’t wait to try this myself. Thanks for such clear instructions. So cute! I’m thinking of making one for our boat dock. Hopefully, it’s comfortable enough for bare feet. Great idea! 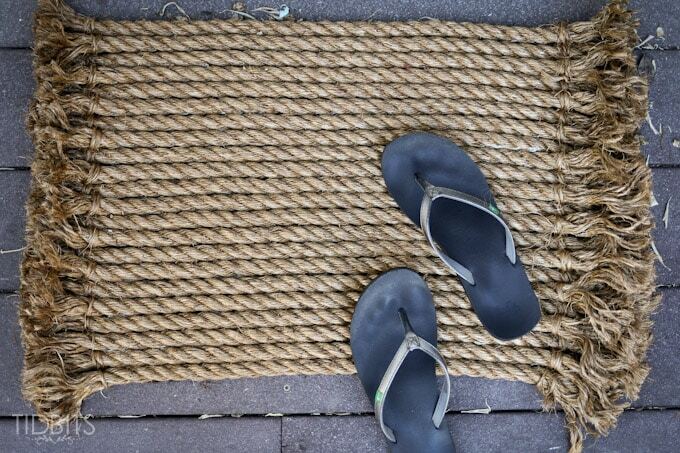 This would be adorable for a boat dock – however – I feel I should mention the rope is not all that comfortable on bare feet. It bothers my kids to stand on it without shoes. Perhaps if you used synthetic rope it would ware better with water and not be as prickly. Just some thoughts! I love this rug! My middle-or-the-night ideas have never turned out this gorgeous. Haha! Mine rarely do! Thank you for the sweet comment! 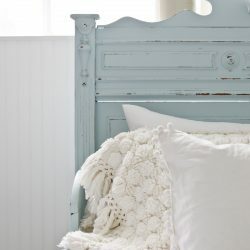 I love it all, the pictures, the colors, the model etc… The rug is a fantastic idea, I am pinning it for a future project. I just love the look. Thank you for sharing. 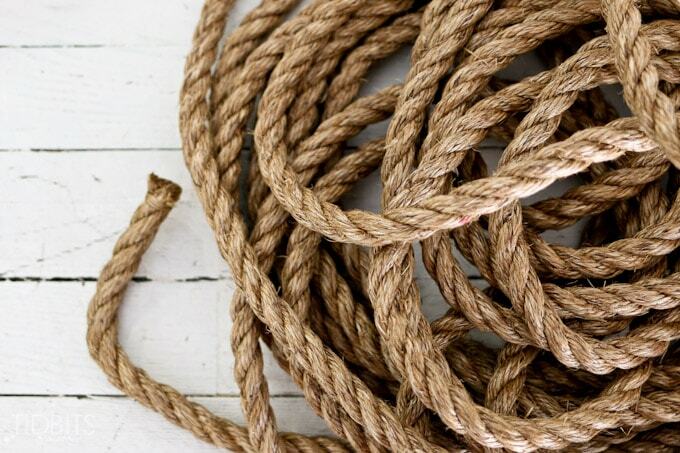 This site sells rope in spools of 600′ for a very good price. I haven’t purchased it yet so I can’t vouch for the quality but I’m thinking natural fiber robe is natural fiber rope… How much difference can ther be? If I’m wrong to think that please let me know. Wow! What a brilliant idea! And what a labor of love I bet it was! If you ever think to send me a photo, I’d love to see the finished product! 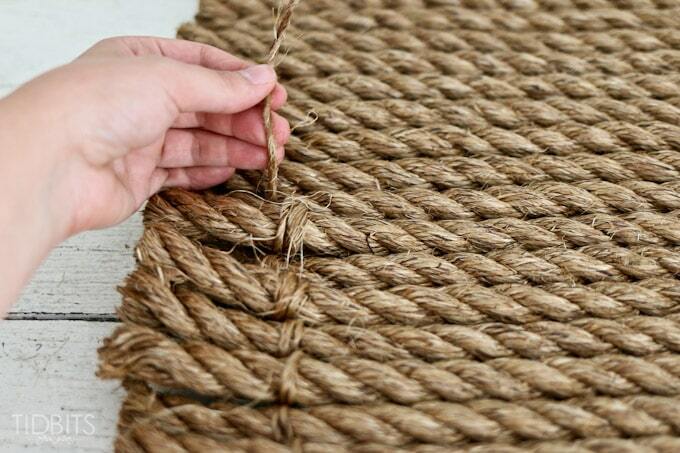 Hi, I was.planing to make a big rope rug in living room, just like u did. Can u please send a picture of theone you made, I would.like to see how it looks.like in room. Since my living room is way too big, I.want to make a rug 12 sqare meters, but I have no idea how many meters of rope I need?! Thank you very much!! !